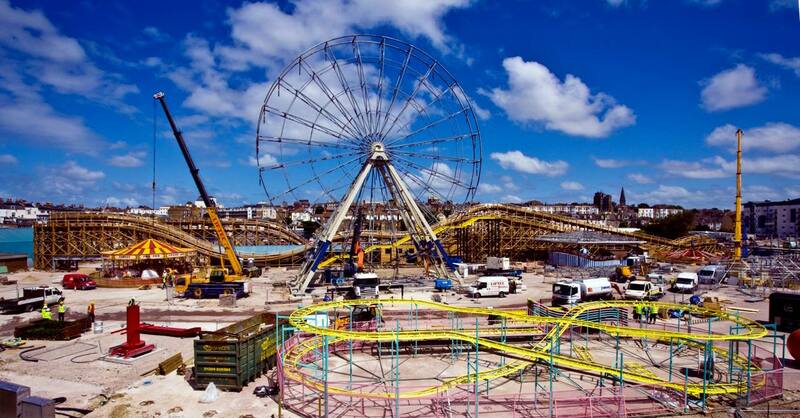 Dreamland is set to open in less than a week. I’m excited, but I’m also worried. It’s £2.3 million over budget, it doesn’t look ready and its biggest single provider of public money seems to think that management is a bit of a shambles. The scenic railway is unfinished, the log flume has been dropped from plans and despite months of hype there are still seem to be nearly 500 tickets left for the opening night “Hullabaloo”. What’s going on? Dreamland operator Sands Heritage Ltd (SHL) — with whom TDC signed a non-binding Heads of Terms in October last year – clearly set itself an optimistically early opening date, after emerging as most-favoured potential operator. The project, meanwhile, is reportedly already some £2.3 million over budget and seems far from ready, even for its initial stages. (When will staff be trained to operate the rides, given that they are only just being put in place?) The reasons for this are no doubt multifarious, but it seems a significant cost overrun this early on. I’m excited by the reopening and I don’t want to piss on the bonfire from which the Dreamland phoenix is rising (we all love a narrative of rise, fall and redemption/resurrection), but alarm bells are faintly ringing. I’ve spoken to quite a few serving and former staff– plenty have come and gone already — at various levels at Dreamland. Their criticisms of project management, by TDC and by SHL are notably strident. And they are not alone in having concerns. As custodians of National Lottery players’ money we have raised some concerns with the Dreamland Trust and Thanet District Council particularly regarding project management and reporting. We remain confident that the regeneration of Dreamland Margate is being delivered to a high standard and, over time, will realise impressive benefits for the local economy and Thanet’s residents. I really hope they are right; it certainly has the potential to be a success and £18.6 million should jump-start any commercial business nicely! An aside: Ironically,with Dreamland set to be handed over under a 99-year lease to a recently established private company, TDC’s draft local plan still envisions the site run as a not-for-profit enterprise. I believe this was the dream of the Dreamland Trust trustees who raised so much of the public money, before being pipped to the punch for the operatorship by new kids in town SHL; now tidily getting the site for a century too. One local property developer, bearish on Dreamland’s commercial potential, tells me snidely that this is precisely what he would do, given the chance. Sands Heritage Ltd bosses will no doubt understand, if not accept, the cynicism. Thanet has seen a lot of bungled and botched developments and property scandals and the long-term lease of neighbouring Arlington House has not proven wise. Getting off to a bad start could kill Dreamland. And it’s too big for this town to fail.